A study elicits the inner aspects of a specific subject. It enhances the thinking power and creativity of the students which is very much essential to our real life. This plan has covered the different arena of Waste Management which has created new thoughts of market of recycling waste in big cities of Bangladesh such as Dhaka. Dhaka Recycling, whose area of business will be to collect, recycle/compost, and market waste from municipality waste processing plants for use as a consumer good. It will be formed as a Private Limited Company in Bangladesh. 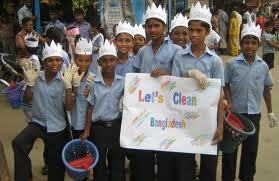 Dhaka Recycling business will be located at Zurain in Dhaka which is permitted by City Corporation. In the future, Dhaka Recycling plans to expand by opening additional recycling facilities throughout Dhaka and beyond. Dhaka Recycling’s mission is to ensure the financial well being of the business, to provide municipalities with an economical, alternative for the disposal of human waste sludge and to provide a top quality, recycled material to the consumer so that they may benefit from compost’s many good properties and organic elements. Dhaka Recycling’s recycled waste will be targeted toward fertilizer manufacturers, nurseries, landscapers, farmers, government agencies, golf courses, and others. All of these potential customers will benefit from the compost’s numerous soil enhancing characteristics. Additionally, we will offer a service to waste processing plants owned by municipalities. Dhaka Recycling is entering a niche market in that human waste sludge has not been recycled on any sizeable scale in Dhaka. This is a unique and viable concept that addresses the needs of various customers and reaches an untapped market with tremendous growth potential. Its products and services offer needed solutions to municipalities and the market for organic soil enhancement products. Our major product will be recycled (composted) human waste sludge for use as a fertilizer. The human waste sludge used in Dhaka Recycling’s process will be picked up from municipalities. Upon arrival at our recycling facility, the sludge will be placed into one of six organic in-vessel digesters. The sludge is then placed into one end of the digester. To make compost, additional dry fibrous material such as sawdust, wood chips, or bark must be added. After the process completes, the material reaches the opposite end of the unit where it is removed. As per its blueprint, Dhaka Recycling analyzed the market, segmented its markets to different sectors, assessed the risks involved, determined the organizational hierarchy, and finally made the estimated financial statements to portray the probable business situation considering all risks and uncertainties of frequently changing economic conditions.